And yet this barely caused a ripple in asset prices for one simple reason: the Bank of Japan's asset purchases absorbed all the bleeding, exposing the central bank's outsize role in the market. Indeed, as the Nikkei adds, this near-record liquidation was matched nearly yen for yen by the BOJ's pumping of money into the economy through asset purchases, with the central bank buying 5.65 trillion yen worth of equity! Of course, there were legitimate reasons why foreign investors felt the urge to liquidate Japanese holdings: international investors unloaded Japanese shares as they became alarmed by concerns about a global slowdown. With many Japanese manufacturers reliant on exports, overseas analysts cut their recommendations for those stocks amid China's decelerating economy and Beijing's trade war with the US. Last July, the world's largest asset manager, BlackRock, downgraded its investment stance on Japanese equities to "neutral" from "overweight", the first such revision in about 20 months. Separately, the world's 3rd latest asset manager, State Street Global Advisors, shrank its portfolio allocation in equities during the latter half of 2018, citing the protracted Sino-U.S. trade war and how that would affect risk assets. The investment house also downgraded its recommendation for Japanese equities from neutral this year, citing the risk of yen appreciation. In light of such prevailing bearishness among foreign investors, one would think the Nikkei got clobbered, and yet the broadest Japanese index is now above where it was this time last year. Why? Because in its attempt to preserve confidence and avoid what could be a potentially devastating asset selloff in a world in which stock markets are the leading indicators for regional and global economies, the BOJ stepped up its purchases of Japanese stocks through ETFs. A first among central banks, the program began in 2010 when the Nikkei Stock Average was trading below 10,000 points. The central bank's stated objective then was "to lower the risk premium, and the purchasing volume stood at 450 billion yen." 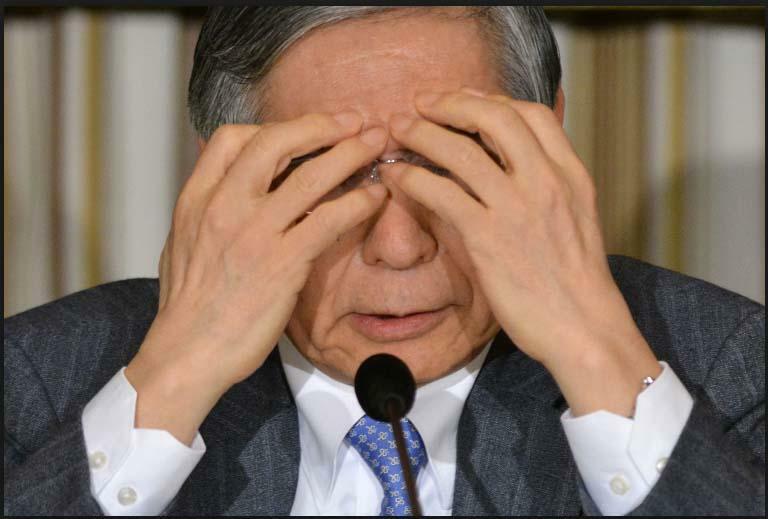 Why does the BOJ continue to engage in such destructive, for price discovery and financial analysis, behavior? Well, the stated purpose behind such blatant intervention in capital markets, is that the BOJ was using ETF purchases to stoke inflation by spurring gains in asset values, as well as promoting active private consumption. Has the BOJ had any success in its narrowly-defined mission? 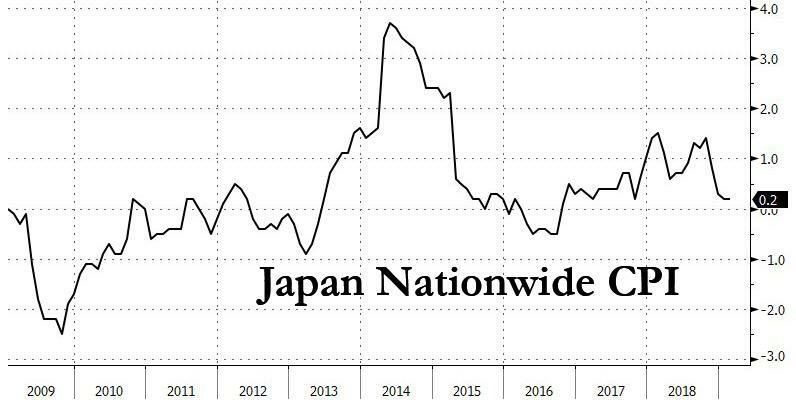 As the chart below shows, the answer is a resounding no because aside from a brief period of sales-tax induced price increases, Japan's nationwide CPI is now the same as it was ten years ago. Meanwhile, as the Nikkei cautions, having a central bank directly prop up stock prices carries inherent risks: one among them is that if the Nikkei average sinks below 18,000, the market value of the ETFs held by the bank will fall below book value, BOJ Deputy Gov. Masayoshi Amamiya warned in March. Though the index remains well above that threshold, a sudden downturn would damage the BOJ's net worth and potentially shake confidence in Japan's currency. Such a long overdue collapse in the yen is precisely what would cause the Kyle Bass widowmaker "short JGBs" trade to finally succeed; it would also mean the end of Japan's economy as we know it. While perhaps not nearly as dramatic, the BOJ's now constant intervention and participation in capital markets means that any feedback loops between assets prices and input signals is now forever lost, and means that management teams no longer can appreciate if any given executive decision is ultimately good or bad as the market's ability to reward and punish has been muted (at least until the BOJ loses control), and as such every corporate decision, no matter how disastrous for the company, its employees, shareholders and peer companies, is seen as beneficial, yet it most likely merely masks the seeds of the enterprise's own demise. Finally, going back to the beginning, the BOJ's terminal destruction of any feedback loop between executive decisions and capital markets means that no practical analysis is possible any more, and the only observations that make sense are those which put central bank manipulation of asset prices in context, which incidentally is impossible as monetary policy is ultimately a political signal thereby making capital markets a subset of government policy and pure financial analysis not only obsolete, but self-defeating. Worst of all, this is an unsustainable equilibrium, and the best that the BOJ (or Fed, or ECB) can hope for is to kick the can for another month, quarter or year, even as the price and corporate imbalances build up to unprecedented proportions. Then, when central bank involvement is no longer possible (unlike the recent attempt at interest rate normalization by the world's central banks which lasted for just about a year before banks resumed easing), everything will inevitably crash as the first and last price backstop is gone, and shareholders rush to liquidate in a wholesale panic. As a result, the only possible attempt to preserve "value" will be for authorities to halt capital markets indefinitely in a last ditch attempt to make selling impossible. And while global capital markets are now delighted by the recent U-turn in monetary tightening, it just makes the eventual moment of reckoning that much more painful. Which is why for all those who are currently allocating capital to what can only be called a "market" in some comical context, our advice is simple: have an "exit" plan for precisely that moment when exiting will be made illegal, and Ludwig von Mises will be proven right once again.